The silhouette comes into focus as you shift views. 50 years after a Portland State University professor helped spark a statewide cycling movement, a new sculpture will be erected to celebrate his work. In 1971 the Oregon State Legislature passed a bill mandating a minimum of 1 percent of state highway project funds be used for cycling and walking infrastructure. The “Bike Bill” (ORS 366.541) as it became known, was signed on the capitol steps from the seat of a bicycle by then Governor Tom McCall. In 1995, the Bike Bill was used by The Street Trust (then the Bicycle Transportation Alliance) in their successful lawsuit against the the City of Portland, and it remains an important tool that helps us hold the Oregon Department of Transportation accountable for building a system that serves more than just automobile users. Now Oakland’s work will be remembered with a piece of public art to be dedicated later this winter. 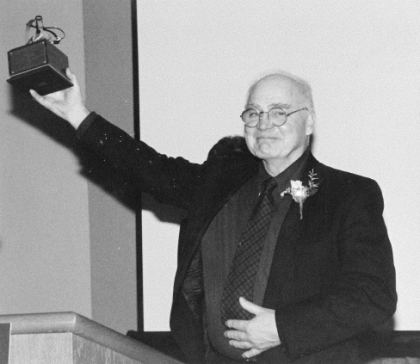 Sam Oakland in 2001 when he received a lifetime achievement award from The Street Trust. The Oregon Environmental Council is behind the project. It’s one of three such “Art of Loving Oregon” projects they’ve undertaken to commemorate their 50th anniversary. The other two are the “Bottle Bill” that spurred recycling and the Oregon law that laid the foundation for our state’s anti-sprawl and farmland preservation regulations. Dubbed, “Anthropocene” (a term for our current geological age that’s defined by human impacts) the six-and-a-half foot tall sculpture created by PSU School of Architecture students (overseen by Aaron Whelton) will be erected on the southwest corner of SW 10th and Harrison, just across the street from the Millar Library on the PSU campus. 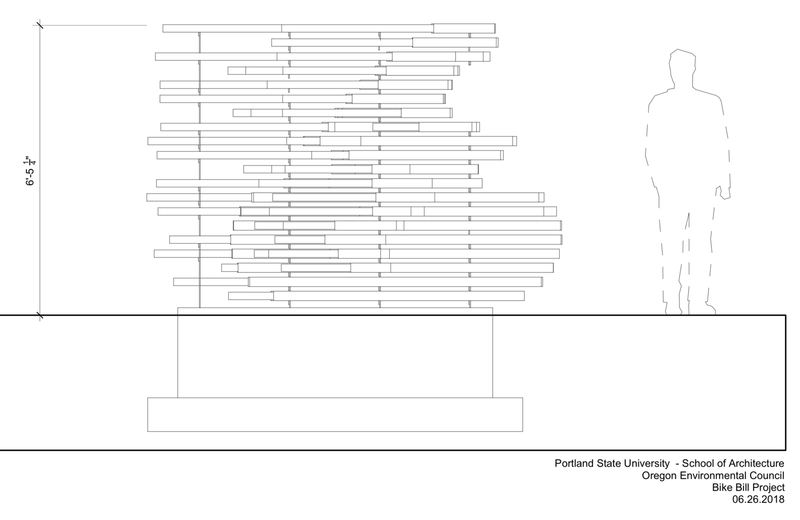 According to sketches provided to BikePortland, the somewhat abstract sculpture will be just over nine feet long and two feet wide. A series of two-inch diameter pipes separated by half-inch thick steel plates will create an outline of a bicycle and its rider in motion. 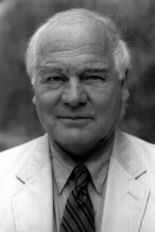 Stay tuned for details on the dedication ceremony event and photos after it’s installed. What can I say that hasn’t been said before, but that will not stop anybody from saying all again. Once I read the explanation I can totally see it. PCC has a similar sculpture on their SE campus. I just hope he changes the color so it doesn’t look like a stack of cigarettes. Very appropriate, IMO. It looks like one of those bike lane pavement markings, well-worn and in need of a repainting from a local government that doesn’t care, who has traffic engineers who use bike lanes to direct and calm car traffic, but not to improve actual bicycle user safety one iota. Kind of sums up ODOT’s attitude towards bicyclists, yes? Bonus: If you crash into it, you’ll get multiple core samples. How about building a couple of miles of NEW bike lane and naming the section the “Sam Oakland bike lane” instead of spending it on some random piece of art? Yep, looks like cigarettes. Doesn’t appeal to me at all. Why, oh why, don’t they ever ask the poor suffering public — who will have to stare at these things forever — what WE think of these things, BEFORE they plunk down a ton of cash for them? A statue that LOOKS like a bicyclist would have been nice. It reminds why I hate that infuriating Arts Tax. Which I have just stopped paying anyway. Ugly. Not happy that we get no say in the expensive sculptures bought with our arts tax dollars. Article says “it is designed so that from most perspectives, it looks like a random collection of pipes”. Why not make something that looks like a bike from most perspectives? People walking past quickly may just think of cigarettes. Good god. How many people were involved in crafting that sentence, and could someone explain what it’s supposed to mean? I don’t see it at all. Nothing, nada, zip. Can someone who does see a silhouette of a cyclist in that loose bundle of cigarettes please explain it to me? I can’t even figure out which way it’s going. Look at this and then look at the top right picture. Thanks. The made it visible for me. How much will this ridiculous piece of “art” cost? Why do you have “art” in quotes? When it comes to art, you can never please all the people at any time — particularly with public art. I’m not necessarily a fan of this sculpture, but I also recognize that this is just a crude 3d rendering of it. It will look quite different in context and made out of actual materials. I doubt it will look like cigarettes in its final form (but it will likely look just like a collection of random pipes from most angles). The way Portland celebrates bicyclists is to make their assigned representational art piece not look anything like a bicyclist? “Start seeing bicycles” and bicyclists. 1% for cars? Maybe 25% each for freight & transit? The rest for pedestrians? OMG, the outrage over a non-realistic sculpture. Where have I seen this before? Guess which one is more popular….